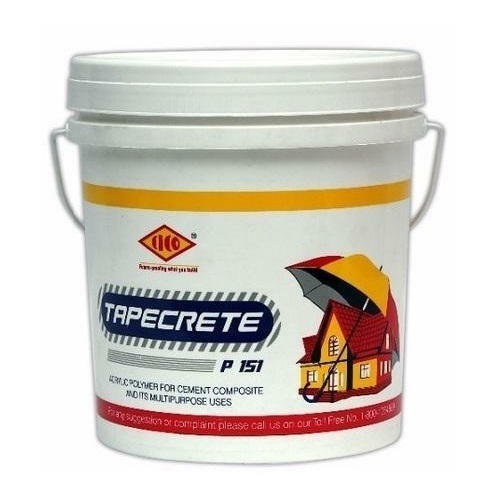 Owing to our enriched industrial experiences, we are devoted towards providing a wide variety of excellent quality CICO Tapecrete Waterproof Coating. Incepted in the year 2011, Adchem Enterprises is amidst the notable organizations in the market immersed in the business of providing an enormous variety of Retailing, Wholesaling and Trading a number of products comprising External Coating, Waterproofing Coatings, Concrete Admixture, Concrete AID, etc. The collection of products and services presented by us is delivered under the command of knowledgeable personnel at our end to uphold their excellence at reliability at the end of our patrons. More to this, these are widely commended and necessary owing to their exactness, cost effectiveness and consistency. Along with this, we are also offering a broad assortment of products which are developed and manufactured at the end of our vendors with excellence using supreme grade material and highly progressive techniques. Authorized by a highly proficient and knowledgeable crew of adroit personnel, we have received huge proficiency in the respective domain. These enthusiastic and hardworking employees are dedicated to put their meticulous hard work towards approving the achievement of extreme satisfaction of clienteles and maximum profit for our organizations. Being well-versed with all the features of this realm, our employees lead us to conduct the whole business operation in the suitable possible way. Our team comprises executives, engineers, quality analyzers, R & D experts, sales and marketing administrators and Warehouse and packaging experts. Under the able guidance & leadership of our mentor, Mr. Shailesh Bahri, we have seen all the ups & downs came into way since our beginning. His steady efforts towards meeting clients' individual demands have authorized us to garner enormous customers all over nation.